Heavy duty three phase generator. AVR alternator for smooth power output. Best Prices & FREE DELIVERY! 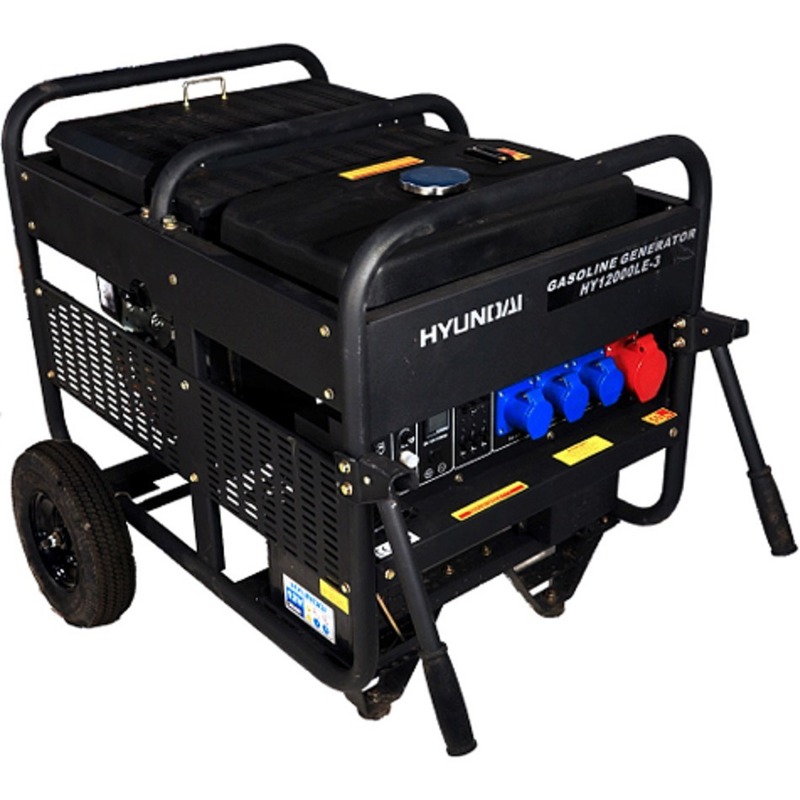 The Hyundai HY12000LE-3 is a large open frame petrol generator which has a maximum output of 10kW, making it the most powerful petrol generator from Hyundai Power Equipment. This machine is the three phase version of the HY12000LE. It’s powered by the Hyundai HY2V680 and pushes out a massive 20bhp from its 640cc V-twin 4-stroke configuration. For effortless operation the HY120000LE-3 can be started via electric remote or key, guaranteeing an easy start in every situation. It’s fitted with an AVR alternator which produces a smooth power output at both 230v and 400v, allowing you to power all tools, equipment and devices without fear of any damage being caused. As with the HY12000-LE, this unit is fitted with a wheelbarrow frame and has large wheels attached. This makes the 167kg machine surprisingly portable and can be moved from the site of one job to the next with ease. This three phase version of the HY12000 model is generally used to power larger motors and machines with heavy loads. Generally three phase machines are more suited to industrial work or on-site construction duties. A three-phase system is usually more economical than other types of electrical phases. A 3-phase system uses three circuit conductors carry three alternating currents (of the same frequency) which reach their peak values at different times, and this generator can be used reliably to deliver 12kVA split over 3 phases.